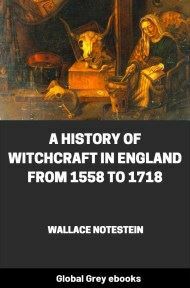 Chapters include: On A Possible Revival Of Witchcraft; A Sabbath-General; The Origins Of The Witch; The Half-Way Worlds; The Witch’s Attributes; Some Representative English Witches; The Witch Of Antiquity; The Witch In Greece And Rome; From Paganism To Christianity; The Witch-Bull And Its Effects; The Later Persecutions In England; Persecutions In Scotland; Other Persecutions; Philtres, Charms And Potions; The Witch In Fiction; and, Some Witches Of To-Day. To the superficial glance it might seem that he who would urge a revival of witchcraft is confronted by a task more Herculean than that of making dry bones live—in that the bones he seeks to revivify have never existed. The educated class—which, be it remembered, includes those who have studied in the elementary schools of whatever nation—is united in declaring that such a person as a witch never did, never could, and never will exist. It is true that there are still those—a waning band—who, preserving implicit faith in the literal exactitude of revealed religion, maintain that witchcraft—along with Gardens of Eden, giants, and Jewish leaders capable of influencing the movements of sun and moon— flourished under the Old Dispensation, even though it has become incredible under the New. 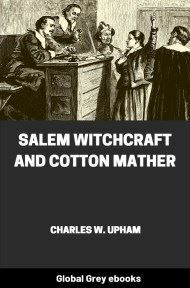 Yet, speaking generally, the witch is as extinct in civilised men’s minds as is the dodo; so that they who accept as gospel the vaticinations of racecourse tipsters or swallow patent medicines with implicit faith, yet moralise upon the illimitability of human superstition when they read that witch-doctors still command a following in West Africa, or that Sicilian peasants are not yet tired of opening their purses to sham sorcerers. Were the reality of sorcery dependent upon a referendum of our universities—or, for that matter, of our elementary school mistresses—it were at once proclaimed a clamant imposture. 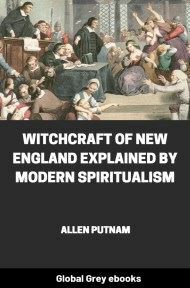 Fortunately for the witch, and incidentally for a picturesque aspect of the human intellect, the Enlightened, even if we include among them those who accept their dogma as the New Gospel, are but a small—a ridiculously small—item of the human race. Compared with the whole population of the world, their numbers are so insignificant as to be for all practical purposes nonexistent. There are villages but a few miles beyond the boundary of the Metropolitan Police District, where the witch is as firmly enthroned in the imaginations of the mobility as in those of their ancestors three centuries ago. There are many British legislators who would refuse to start an electioneering campaign upon a Friday. I myself have known a man—and know him still—a Romney Marsh-lander, who, within the last decade, has suffered grievously—himself and through his children— at the hands of witches whose names and whereabout he can detail. And I have known a woman—she kept a lodging-house in the Kennington Road—who, if not herself a witch, was yet the daughter of one, and of acknowledged power. It is true that, if the daughter’s tale— told to me in the small front parlour in intervals between the crashing passage of electric trams and motor-lorries—may be accepted, her mother’s gifts were put to no worse use than the curing of her Devonshire neighbours’ minor ailments. There is no need to go fifty, nor five, miles from London to find material for a revival in Black Magic. Scarcely a week passes but some old crone is charged before a Metropolitan police magistrate with having defrauded silly servant-girls on the pretence of telling them their futures. You cannot pass down Bond Street during the season without encountering a row of sandwich-men—themselves preserving very few illusions— earning a meagre wage in the service of this, that, or the other Society crystal-gazer, palmist, or clairvoyant. Who has not seen some such advertisement as the following—quoted from a current journal—proffering information about the future, "calculated from astrological horoscopes,” at the very moderate charge of half-a-crown. The advertiser—in deference to modern convention he is described as a "Professor "rather than a sorcerer—further protests his mastery of Phrenology, Graphology, Clairvoyance, and Psycho-metry. And this advertiser is but one of many, all seeking to gain some humble profit by following in the footsteps of Diana and Mother Demdyke of Pendle Forest. Are there not a hundred and one select Societies, each with its band of earnest adherents—many with official organs, published at more or less regular intervals and commanding circulations of a sort—openly furthering "arts "such as would, two centuries ago, have entailed upon their members the charge of Witchcraft? Is not spiritualism exalted into an international cult? The very existence of such a coterie as the "Thirteen Club,5’ with a membership sworn to exhibit, hie et ubique, their contempt of degrading superstitions, is the strongest testimony to their ubiquitous regard. Most curious fact of all, it is in America, the New World, home of all that is most modern and enlightened, that we find superstitions commanding most implicit faith. It is only necessary to glance through the advertisement pages of an American popular magazine to realise how far the New World has outstripped the Old in its blind adherence to this form of faith. Nowhere has the Hypnotic, the Mesmeric, the Psychic Quack such unchallenged empire. 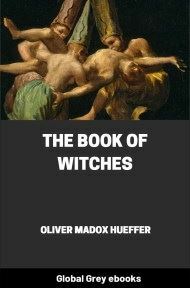 In Lady Charlotte Bury’s "Memoirs of a Lady in Waiting" we find an example of the belief in Witchcraft cherished in the most exalted circle in the nineteenth century. Writing of the unhappy Princess—later Queen— Caroline, wife of George IV., she says as follows:—“ After dinner her Royal Highness made a wax figure as usual, and gave it an amiable addition of large horns; then took three pins out of her garment and stuck them through and through, and put the figure to roast and melt at the fire. . . . Lady - says the Princess indulges in this amusement whenever there are no strangers at table, and she thinks her Royal Highness really has a superstitious belief that destroying the effigy of her husband will bring to pass the destruction of his Royal Person.” We laugh at this instance of Royal credulity; yet is not the "mascot "a commonplace of our conversation? Madame de Montespan, it is recorded, had recourse—not without success—to the Black Mass as a means towards gaining the affections of Louis XIV. It is but a few years since the attention of the police was directed towards the practices of those—Society leaders for the most part—who had revived, in twentieth-century Paris, the cult of Devil worship. The most widely circulated London newspapers of the day gravely discuss in "special articles "the respective value of various mascots for motorists, or insert long descriptive reports of the vaticinations of this spiritualist or that wise-woman as to the probable perpetrators of mysterious murders. This is no exaggeration, as he may prove for himself who has patience to search the files of the London daily Press for 1907. And, be it remembered, the self-proclaimed mission of the contemporary Press is to mirror the public mind as the most obvious way of instructing it.